English country dance has its earliest documented instance in the late 16th century. If you’ve watched Pride and Prejudice on television or seen Sense and Sensibility or Emma at the movies you’ve seen English country dancing. But it certainly is not the obscure relic you might think it to be! Dancers move in a number of specific figures, sometimes holding hands, sometimes by themselves. Each dance is prompted by a caller, so that each figure and movement is called in time to the music; you don’t need to rely on your memory alone to know what to do. While this form of dance has been around for several hundred years, it’s still thriving today, with many new dances being composed. Our regular dances include many that were written in the 17th and 18th centuries, as well as those that have been composed within the last ten years. The video below will provide an idea about how English country dances look and feel. Additional videos are available. 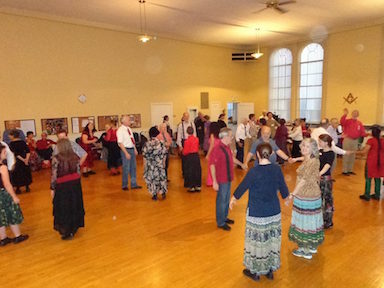 Our English country dances are usually held from 2 PM to 5 PM on Sunday afternoons, at two locations in the Sacramento area: in Roseville on the first Sunday of each month and, beginning October 2018, near downtown Sacramento on the third Sunday of each month. Please check our calendar for specific locations and information about each dance. No partners are needed, and beginners are welcome. Newcomers are strongly encouraged to come at 1:30 PM for an Introduction to Basics workshop that is held prior to each dance. Dancers attending this workshop for the first time receive a coupon for half-off admission at their next SCDS dance! It’s always nice when people bring snacks to share at the break, and you may also want to bring your water bottle to stay hydrated while you dance. Are you already an active member of the English country dance community? If so, you may be interested in a month-by-month listing of all the dances we’ve done in Roseville (our first-Sunday dance) and Sacramento (our third-Sunday dance). These are large Excel spreadsheets that may be downloaded.